The aircraft industry is always adapting and developing as advancements in technology, materials and construction are achieved. This means commercial aircraft cabin interiors are constantly changing, too. For aircraft owners and their passengers, it’s important to stay current on the latest advancements. Today, the future of airplane cabin design looks more comfortable and enjoyable than ever. Here is some of what you can expect to see if you travel by air or own a commercial aircraft in the coming months and years. If you’ve flown on a commercial aircraft lately, you may have noticed some recent changes. That’s because airlines are constantly upgrading and competing to satisfy customers and earn their loyalty. For instance, British Airways is making a £6.5 billion investment that will include upgrades to its Premium Economy cabin, including enhanced service, a superior dining experience and new furnishings. Similarly, LATAM Airlines is unveiling new cabin interiors in more than 200 of its aircraft. Malaysia Airlines is rebranding its First Class as Business Suite, which will feature First Class Lounge access, a 50-kilogram baggage allowance and fine dining while on board. French Airline Joon S.A.S will introduce a new family-friendly concept for long-haul flights featuring modular seats that can transform into a play area for kids or a comfortable bed. It’s easy to see that trends are leaning toward a more comfortable experience for everyone aboard, especially those willing to pay for additional luxury. Aircraft manufacturers are continuously developing new ways to keep travelers comfortable and happy while adapting to the challenges of the airline industry. The future may include concepts aircraft owners and passengers have never seen before, including a reconfigurable cabin. This advancement could allow airlines to change the layout of their cabins to suit the demand, based on the number of passengers interested in economy, business or first class. While the reconfigurable cabin will require numerous certifications and may take time to come to fruition, it’s likely many airlines will work toward providing a more spacious cabin environment in the near future. This will likely involve optimizing seat contours and advancing ergonomics to enhance passenger comfort. This is especially relevant in Premium Economy and Economy cabins, where space is limited. Air travelers who typically don’t want to pay extra for Business or First Class will be thankful for these future advancements. At Aero Marine Interior, Inc., we’ve been in the airplane cabin interiors industry for more than 18 years and have seen airplane cabin design trends come and go. As the industry advances, we advance with it. We stay up to date on the latest improvements in commercial airplane cabin interiors so we can help our customers achieve interiors that are comfortable, modern and on-trend. 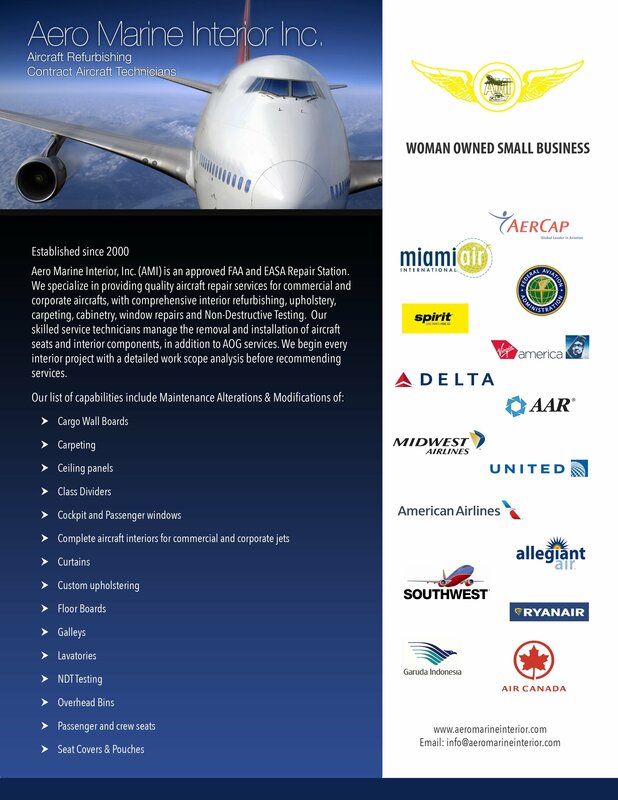 Give us a call or complete our online contact form to upgrade your airplane cabin design with the help of some of the most experienced techs in the industry.